Beautiful colors and great fabric. My niece and nephew love it. Modern styling expressed in luxurious pieced poly-suede and shadesof navy, medium blue and gray exudes calm in the Madison Park Sabancollection. A comforter, shams, a bedskirt, and three throw pillowscomplete the seven-piece set and create a focal point of quietelegance. Details of quilting, pleating and piecing combine topresent a textural palette to enhance a contemporary setting aswell as more traditional aesthetics. Looks good, comfortable, but about 10 inches too short for a California King. I bought this set to update my 17 year old son's room. It was a perfect update to transition the room from adolescent to young man leaving for college in 1.5 years. The fabric is a good substantial weight, but not reversible. Shams, throw pillows all nicely made. The top 1/3 of the comforter is sold gray, but looks fine when shams and throw pillows are added. It will serve guests nicely while our son is away at college. Would recommend. This comforter was actually my 3 rd choice after 2 nightmare incidents where I order one color got another, and ordered a different design and the colors did not match. But, this comforter set colors were exactly the colors shown. It should have been my first choice. The comforter is very soft and I love all the accessories that came with it. I bought for my son's bedding for his first apartment. He loves it too. I ordered this set from Overstock a few weeks ago after we upgraded to a king size bed. Found the same product at SEVERAL different stores and Overstock, by far, had the best price. I went with the reviews from Penney's but they wanted $*** for it...yes $***. Even after they had a 50% off sale which still would have been way more than I paid here. I LOVE this set. The comforter is so warm or if flipped a little cool. Both sides are extremely soft. I didn't realize it was reversible so it was a pleasant surprise. The reverse side is solid blue and a different material. Both sides are incredibly soft. The colors are gorgeous and true to picture. Goes perfectly with my ocean themed bedroom. Great buy. Arrived right on time as promised. Look no further and buy it from Overstock. . I love this comforter! The fabric feels wonderfully soft and luxurious. I also love that it came with all the throw pillows and the bedskirt to complete the look. Very happy with this purchase. This is our second set purchased. We liked our first set so much we goat a 2nd one in a different color scheme for our guest bedroom. All items are quality with complementary colors. I looked through several websites until I came upon this particular set. It had just the right amount of blues and greys for my room. It's very soft and comfy. The only negative would be it's not as wide as I would like, so it doesn't completely cover the mattress on the sides, but I've found no manufacturer has figured that out yet! Great bedding set! Good quality and comforter is very warm during the winter. Used for an adult male's bedroom. Looks Beautiful! Made well. Would definitely recommend. This comforter set is so nice and coordinates nicely with the paint color my son chose for his room. It's much nicer than I expected and the material is so soft. My son is happy with it too. This comforter set is awesome! I got it for my son's room, and he too, loves it. 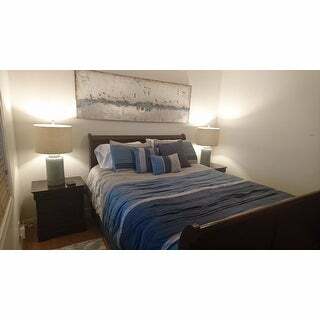 The colors are exactly like the picture, and the comforter itself is very comfortable. I love how soft this comforter is and it is very warm. 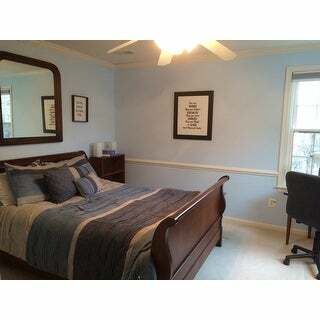 The colors are rich and it looks great in our master bedroom. 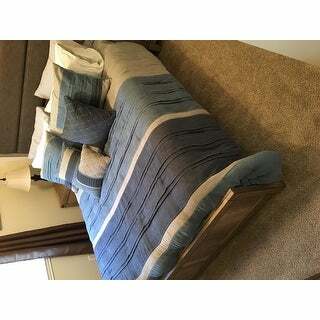 The only reason I didn' t rate it 5 is because it does not hang as low as I would like on the sides of my King size bed with a pillow top mattress. It barely comes to the bottom of the mattress on both sides. The colors are just perfect. The comforter is warm and cuddly. I was delighted to find this nice set. I love the weight of it - not too heavy for Florida climate. Like someone else who reviewed the set before I bought it, I wish the pattern continued the full length of the comforter - about 1/4 of it is plain grey. This is a Beautiful set! Great purchase! So far it seems to be a very durable comforter set. The extra pillows and throws are a nice bonus. Overall good quality set for the money. "Is the picture above bed available for purchase?" Unfortunately no, the picture is not available. "Can this truly be put in the washer or dryer or does it need to be dry cleaned? " Machine wash cold, gentle cycle, and separately. Do not bleach. Tumble dry low, remove promptly, do not iron. If there is no free movement in the washer or dryer, use large capacity commercial washer/ dryer. I have not attempted to wash this comforter. However, in a large capacity washer on a gentle or delicate cold water cycle, I think it would be fine. Then the same in the dryer. However, to be really safe, I intend to dry clean it bc I have had issues with clumping in other instances. "Can you tell me where I could purchase the rug shown in the picture?" "Can anyone tell me the weight of the comforter? Thank you." The filling weight is 270 gsm. "I would like to get a California King size but it's not an option. Do you have it?" We do not have it in this set. "Why doesn't this set also come in full size?" This comforter set does not come in a full size, however the queen size, which measures 90 inches wide x 90 inches long, will just be slightly over-sized on your full size bed. 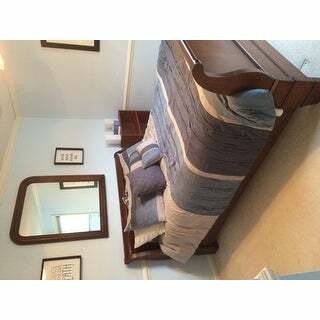 "Where can I find valances that match the Madison Park comforter set? I absolutely love the set and I would like to get the valances as well. Thank You!" At this time we do not carry valances that are specifically designed for this set, however item# 17651219 might work well with this comforter set.